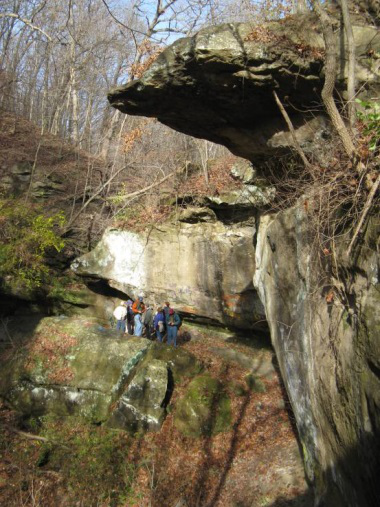 The rocks of rocky glen include sandstone, gray shale, black shale, and coal. The landscape and rocks of Rocky Glen tell an amazing geologic story of massive ice ages floods and ancient tropical coal swamps. The story begins 300 million years ago during what geologists refer to as the Pennsylvanian Period. At this time, central Illinois was located near the equator along the edge of a shallow ocean. To the east, the Appalachian Mountains were at their grandest, rising to the elevation of the Himalayan Mountains today. Rivers drained from the tall mountains flowing westward until they emptied into the ocean in central Illinois. As the waters slowed down, the mud, sand and gravel that flowed in the river settled out along the shoreline creating a delta similar to the bayous and swamps of Louisiana where the modern Mississippi River empties into the Gulf of Mexico. Large ancient trees and plants flourished in the muddy delta creating a forest that would later be preserved as coal. Paleogeography of the Illinois-Indiana region during Pennsylvanian time. The diagram shows a Pennsylvanian river delta and the position of the shoreline and the sea at an instant of time during the Pennsylvanian Period. Illinois State Geological Survey. The rocks exposed in Rocky Glen are a type of rock known as sedimentary rock which form by the deposition of material at the Earth’s surface (like sand gravel and mud) and within bodies of water. Each layer of sedimentary rock records what earth was like in the past. Sandstone: The most common type of rock at Rocky Glen is sandstone. Sandstone is a sedimentary rock composed of sand-sized grains of the mineral quartz cemented together. The 70-foot sandstone bluffs of Rocky Glen were once the sandy bottoms of a river channel meandering back and forth until it reached the ocean. The sandstone contains shiny flakes of mica minerals that were eroded from the crystalline core of the Appalachian Mountains. Look carefully at the layering of the sandstone and you will notice cross bedding. These angular layers were deposited as a sand bar within the ancient river channel. Some of the more horizontal layers of sandstone represent a more transitional environment where ocean tides and wave action spread the sand along the shoreline. 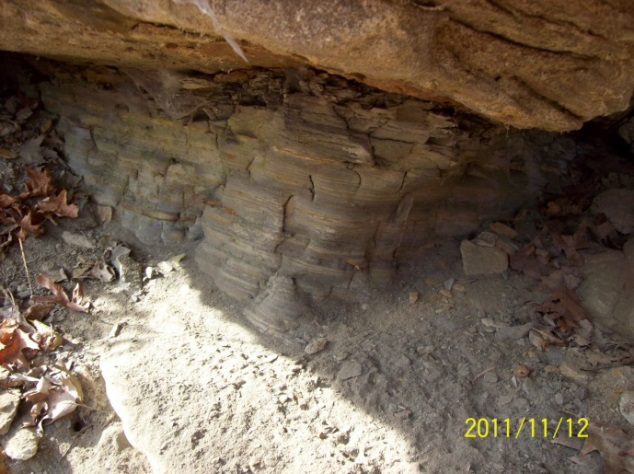 Gray Shale: A sandy, gray shale is found below the sandstone. Shale is a sedimentary rock that forms from the compaction of mud and clay. At Rocky Glen, this thinly layered rock was deposited along the shoreline away from the river or as flood deposits adjacent to the river. Fossil leaves and trees are sometimes preserved in this shale. Coal: The main coal seam at Rocky Glen is called the Springfield Coal and is found about 50 feet underground on most of the property. However, pieces of the coal can be found along the main trail, leftovers from the coal mining operation. The Springfield Coal usually has a yellow/brown discoloration due to its high sulfur content, making it undesirable to burn. Sulfur and other impurities entered the coal when ocean waters periodically flooded the ancient forests. Black Shale: The black shale or “slate” found in piles near the coal mine shaft were left as waste piles from the mining operations. This shale, called the Turner Mine Shale occurs above the Springfield Coal and would get mixed with the coal during the mining operations. Fossil leaves and tree bark are commonly preserved in the Turner Mine Shale. Limestone: There is no limestone in Rocky Glen, although a thin limestone layer is most likely found upstream from the main canyon. 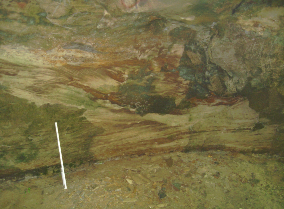 The evidence for this limestone layer is the “Limey” coating on the sandstone under the small waterfall. The stream water conatins a high percent of dissolved calcite or “lime” which was most likely aquired as the stream flowed ontop of a limestone layer. As the water splashes down into the canyon, the dissolved calcite crystalizes ontop of the sandstone, much like a lime deposit foming in your shower. Over the past million years, central Illinois has been repeatedly covered by glacial ice, most recently about 18,000 years ago. Before this time, the Rocky Glen property had just a few small streams and valleys but no bedrock canyons and waterfalls. Kickapoo Creek did not flow past Rocky Glen, rather it flowed from Pottstown eastward through Peoria towards the Illinois River. As the glaciers melted and retreated northward, they deposited a mound of sand and gravel that blocked the flow of Kickapoo Creek. Soon after, enormous volumes of glacial melt water backed up behind this sediment dam forming a narrow lake that extended northwest to Jubilee College State Park. This is why the Kickapoo Creek Valley is up to a mile wide in places north of Rocky Glen. Eventually the lake waters burst through the sediment dam, sending a torrent of water southward carving out a bedrock gorge along Kickapoo Creek from Rocky Glen to Bartonville. These Floodwaters rushed up the Rocky Glen valley, scoured out main canyon, and left the preexisting creeks and land surface hanging high above the canyon floor. Over 70 feet of bedrock was exposed in just a moment of geologic time. As time goes on, the canyon will become wider as the overhangs erode and collapse into the valley. The “dome rock” in the canyon formed this way.